Help! I’ve never moved before! If this is your first time moving, there is a lot of information you need to know in addition to hiring a professional moving company, or bribing your friends with free pizza to help you move. Even if you’ve moved before and have never used a professional moving company such as TWO MEN AND A TRUCK®, there are many things to be aware of in preparation for the big day. An accurate estimate. When you are ready for your free estimate, think about any additional storage spaces (garage, shed, attic, basement, and storage unit) you may have. In many cases customers forget about additional storage so the final bill is more money than the estimate because of these forgotten areas. Be prepared to provide the number of rooms your current house has since this will also help the estimator indicate a time frame. Finally, let us know if there are tight corners, or narrow stairwells in your house, apartment, or condo (smaller than standard doorways). Mention those hard-to-maneuver places when you are getting your estimate. Scheduling your move. Schedule your move in advance. As soon as you know you’re moving, give TWO MEN AND A TRUCK® a call. If you are moving during the busy summer months, it’s especially important to book as far in advance as you can. We are very accommodating to last minute moves, however, during the busy months, it may be difficult to get a move crew the same day or week you call. Booking early will help secure your ideal move day. Parking. Do you live on a steep hill? Do you live in an apartment community? Is your driveway new? Is it a long walk to your house, apartment, or condo? Does your building have an elevator? If yes, do you have to reserve it for your move? These are all important things to consider before the moving crew arrives. If there are any obstacles near your home it’s important to notify the moving company so they can plan ahead of time. Our movers typically drive a 26-foot truck, if you live in an apartment, condo, or senior community, check with the property manager to see if there is a load or unload zone on the property. Help us help you by doing some research before your move. Packing. Will you be packing some of your own items before your move? TWO MEN AND A TRUCK® is a full-service moving company, and we are more than happy to help you get packed. If you would like our specially trained packers to pack your items, let us know when you book your move so it can be included in your estimate. We also sell a variety of moving boxes and packing supplies for your convenience. We post moving tips on our Facebook page every Wednesday, if you’re packing your own items, check them out! Number of boxes. If you’ve never moved before how would you ever know how many boxes you need to fit your stuff? 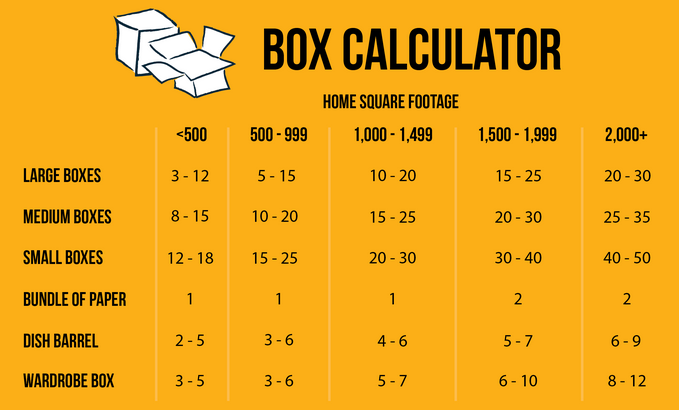 Use this handy guide to help decide the number of boxes you will need to pack your items. Note: the number of boxes will vary depending on the number of items you have in your house. Ask the franchise you are moving with if they will buy back unused boxes. What to expect on move day: Ask for your mover or driver’s phone number for the day of your move. That way, you will be able to contact them if you have any questions or if you need to give them specific directions upon their arrival. Your movers will call when they are on their way to your house. This will help you accurately prepare for their arrival. Also keep in mind to plan for the weather. Rain and snow do not scare us! We will move you under many weather conditions. Remember, movers are people, too. If it’s a blistering hot day, it may be nice to offer your movers water, tea or some other refreshing drink to cool off and keep hydrated. Same for the winter, if it’s brutally cold, allow your movers time to warm up either in their truck or in your home. The time movers take for breaks will not be counted on your final bill. In the whirlwind of planning and this life changing event, sit back and soak it all in. You are about to embark on an exciting new adventure. TWO MEN AND A TRUCK® is the first and largest franchised moving company in the United States. We are subject matter experts and have many moving, packing and organizational tips for you! To learn more about TWO MEN AND A TRUCK® like us on Facebook and subscribe to our blog. Some great advice here. Wish I’d had tips like this the first time I ever moved! It definitely would’ve made things easier! Thanks for sharing this important information for first time movers.